ANJI HENANPLASTIC MACHINERY CO., LTD was established in 1992 based in Zhengzhou, Henan Province, China. For more than 30 years, Anji has been dedicated to the R&D, manufacturing, and industry promotion of polymer melt filtration systems and melt pumps. Today Anji proudly owns a team 80 employers, mostly highly skilled workers with rich experience in the design, manufacturing, and applications of screen changers and melt pumps for polymer extrusion industry. Our products were exported to Singapore, India, Thailand, Korea, Malaysia, Japan, Philippines, Indonesia, UAE, Iran, South Africa, UK, Germany, Turkey, Spain, Bulgaria, Italy, Slovenia, Argentina, Peru, Colombia, Mexico, USA, Russia, and Australia, etc. 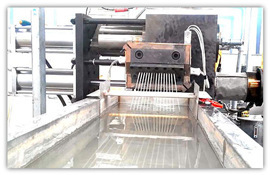 Anji Plastic Machinery Manufactory focuses on the research and application of polymer melt filtration technology, from manual operation hydraulical operation to PLC programmable, continuously adopted the state-of-the-art technology, to provide reliable and leak-free processing. Anji Screen Changers （ Melt Filter） improve the quality of the polymer products by removing contaminants and defective solids in polymer melt. Screen Changer can be fitted to any new or existing extruder, melt pump, reactor or any extrusion line in plastics extrusion processing: the resin granulation process after polymerization, engineering polymer compounding, pelletizing, plastic recycling granulator, blown and cast film extrusion, sheet extrusion, pipe and profile extrusion, spun-bonded and melt-blown nonwovens, etc.